Co-axial impact collision ion scattering spectroscopy (CAICISS) is a novel ion scattering technique that enables a truly surface specific, layer-by-layer determination of the atomic structure and chemical composition of crystalline surfaces. 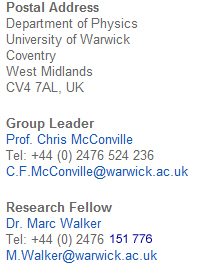 This site is the official home of the CAICISS Group, part of the Surface, Interface and Thin Films Group in the Department of Physics at the University of Warwick, UK. Want to know who we are, what we do or the work we've published? It's all on this site! Our current research programme focusses on the determination of the surface structure of wurtzite indium nitride films, as well as metal alloy, thin film and oxide surfaces. The CAICISS chamber is not only equipped with low energy ion scattering, but also low energy electron diffraction (LEED), X-ray photoelectron spectroscopy (XPS), Auger electron spectroscopy (AES) and a range of surface preparation techniques. The CAICISS facility at Warwick is unique within British surface science research, placing Warwick at the forefront of the UK ion scattering community. Liam's last experiment on the surface structure of CdO(001) was successful, following which he went on to complete his PhD. Congratulations! Recent experimental work has been focussing on the structures of the clean GaN(0001) and InN(0001) surfaces. Sulfur passivation experiments are now in progress. The group presented work on the surface structure of GaP(110) and the various phases of the Cu(100)-Sn system at ECOSS28, in Wroclaw, Poland in August. Our paper on the Cu(100)-p(2x2)-Sn surface structure, studied using CAICISS and MEIS has been published in Physical Review B. Download it here. The experimental programme over the winter months focussed on the surface structures of GaP(110)-(1x1) [presented at ISSC-18 and soon to be published], and MnSb(0001)-(2x2) [for J Aldous' thesis]. After a great deal of experiments and analysis, our paper on the screening potential corrections in CAICISS and the comparison of the FAN and Kalypso codes has been accepted for publication in Surface Science. Download it here. The fast entry chamber was mounted on to the system, reducing the sample turnaround time from a week to just a few hours. The CAICISS group is part of the Surface, Interface & Thin Film Group in the Department of Physics at the University of Warwick.